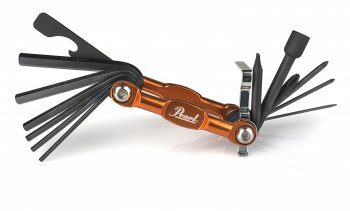 Pearl’s PTT13 Multi-Tool Drum Key is the ultimate all-in-one drum tool, and is perfect for when the unexpected happens. 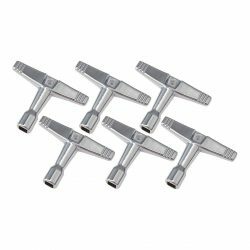 The Pearl PTT13 drum key multi-tool has some great features designed specifically for drummers, with everything you’ll need for gigs, rehearsals, and in the recording studio. It’s made by Pearl, one of the most respected names in drumming, and all materials are high quality. 6 Hex (Allen) Keys (2mm, 2.5mm, 3mm, 4mm, 5mm & 6mm). 5 Screwdrivers (Slotted 1.5mm, 5mm, and Phillips #00, #1 & #2). A bottle opener for when the party starts. 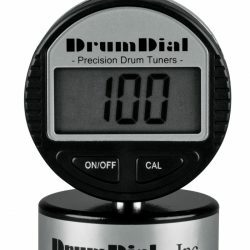 This is the ultimate drummer’s tool, and something no drummer should be without. It’s made from a high quality heat-treated alloy and is built to last. Everything folds away into the body of the tool, making it easy to stash in your drumstick bag and take anywhere. Importantly, the reflective orange colour helps this drum tool stand out on stage. You’ll be able to find it quickly in emergencies, even when the stage lights are turned down low. Don’t get caught out in the middle of a show – make sure you have everything you need! The Pearl PTT13 Multi-Tool Drum Key is featured in our article covering the best gifts for drummers. Check out the other products we’ve included in our huge list of the best drum gifts and accessories out there. There’s also a version for guitarists which we feature in our guide covering the best music gifts for musicians.